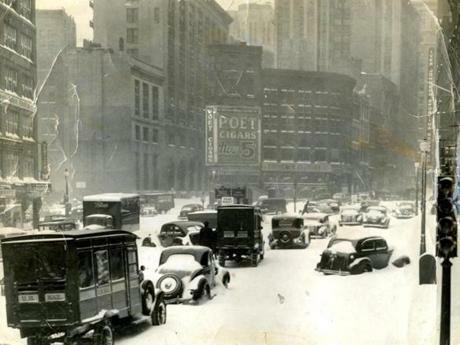 Feb. 14, 1940: Automobiles in Adams Square (Washington Street) in Boston were stalled out in the heavy snow. From the time the snow started at 3 p.m., it fell at at a rate of more than an inch an hour for the first nine hours. 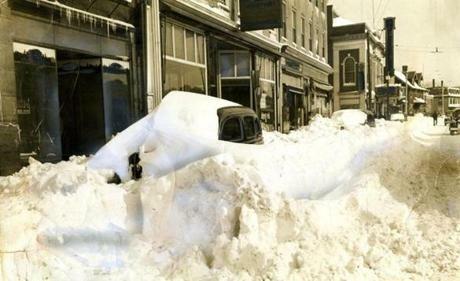 Winds reached gale force of 60 miles per hour, and it whipped the snow into impenetrable drifts. 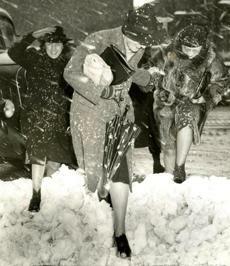 Feb. 14, 1940: Office women who had started home at 5 o’clock could be seen hours later staggering through snow drifts in high heels. 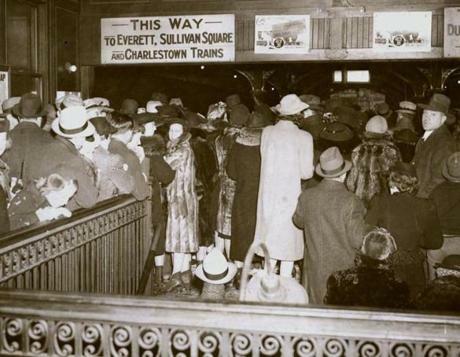 Feb. 14, 1940: The largest single group of stranded travelers were 2,000 Sonja Henie fans who attended her ice show at the Boston Garden and were left without transportation by cessation of service on the Boston Elevated and Boston & Maine Railroad as well as snowbound automobiles. Undismayed, they thronged the North Station's Hotel Manger lobby and restaurants and waited throughout the night. It wasn't until 10 a.m. that the fans were cleared. Extra trains were pressed into service. 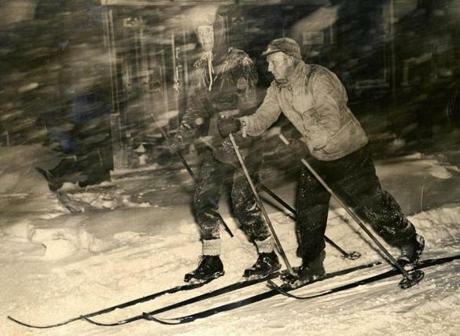 Feb. 14, 1940: These two skiers made good use of the heavy snowfall as they skied on Washington Street in front of the Boston Globe building in downtown Boston. From left are Sven Cederstrom, a member of the Appalachian Mountain Club, and Bjarne Bremer, both of Beacon Hill. 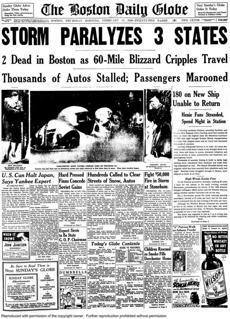 The Boston Daily Globe front page on Thursday morning, Feb. 15, 1940. 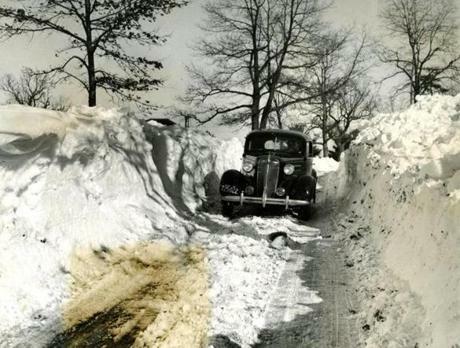 Feb. 15, 1940: Snow was higher than the tops of cars in places along Route 27 in Medfield, and the road was none too wide either. 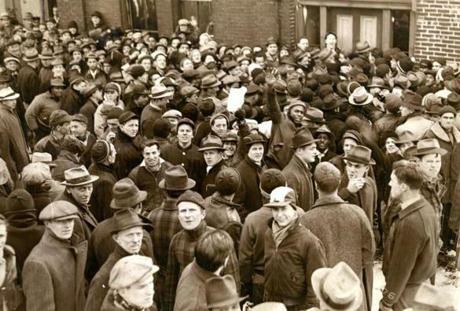 Feb. 15, 1940: Crowds of men ready to go to work shoveling snow waited at the City Yards on Albany Street. 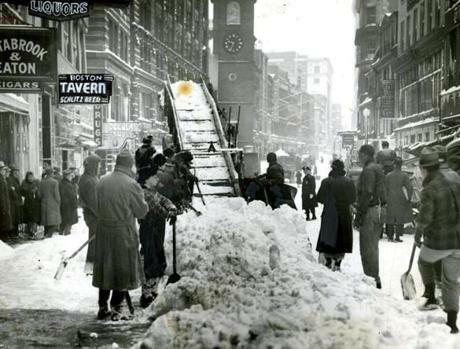 In all, approximately 17,000 men were hired to dig Boston out of its snowy mess as 9,000 WPA employees were authorized to join the force of over 7,500 regular workers and extras. Any man with a shovel could go to his local work yard and get a job. The city couldn't supply shovels though as it had run out of those. 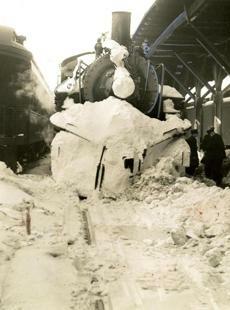 Feb. 15, 1940: Trains were set behind by freezing and jammed switches, as well as the herculean task of digging and plowing through huge drifts on rights of way and in the yards of the main railroad lines into Boston. Emergency crews worked all day and night with flame throwers, oil lamps, and bonfires for the huge task of clearing the way for trains.